Rushing torrents, raging rapids and magnificent waterfalls are home to giant salamanders and a magical legend. The Akame 48 waterfalls are a collective name for a string of waterfalls flowing through Akame-cho, Nabari, Mie. 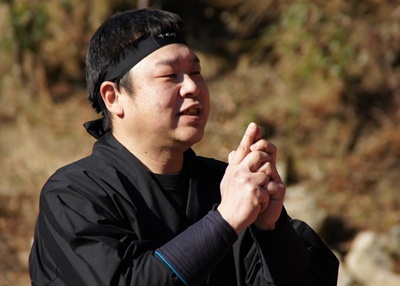 In Japan, more than 1300 years ago, a legendary holy man named En no gyoja was active. It is said the name Akame (red eye) derives from a legend that he met Fudo-myoo (God of Fire) riding a red-eyed ox. They are actually much more than 48 waterfalls, but the number "48" means "Many" in Japanese. 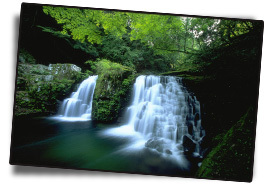 There are various waterfalls in Akame. Among them, five large falls, "Fudo", "Senju", "Nunobiki", "Ninai" and "Biwa" are popular under the name of "The Akame Five Waterfalls". A recreational path about 4 km long along the waterfalls is used as a hiking path to enjoy walking while listening to the sound of the waterfalls. 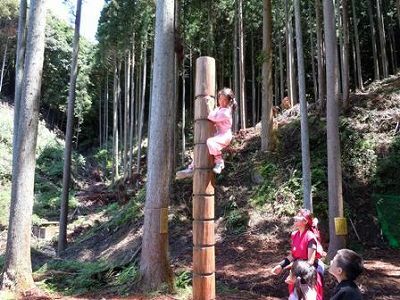 The path is famous for its different aspects according to the season, from cherry blossoms in spring through tender green in early summer, colored leaves in autumn to frozen falls in winter. The Akame ravine have been chosen by Iga style Ninja as a training place as it offer a large panel of natural training environment and for it's strategic localization at that time. Ninja were people engaged in intelligence activities from the 15th to 18th century, when Akame was part of a country called Iga. 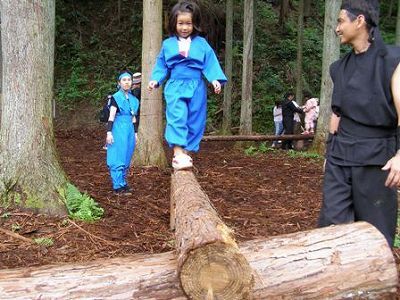 Today, you can put on a ninja suit and experience some ninja activities including the art of hiding, climbing and jumping. 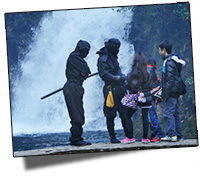 You can also borrow ninja suits to visit and enjoy the Akame 48 waterfalls! The waterfalls peaceful and pollution-free environment is also a habitat for the giant salamanders (Andrias japonicus), which are protected species and registered as Natural Monument of Japan. You may be able to see them swimming in the river when walking between spring and autumn. For those who don't have the chance to spot them directly in the river, the entrance fee include a pass to visit a small Natural museum where the giant salamanders are exposed. 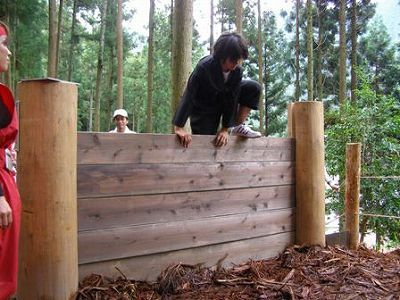 Welcome to The Ninja Forest, Akame 48 Falls, the training place of the Iga Ninja. Born in the shadow, living in the shadow, fighting in the shadow. This training has for purpose to get in touch with the Iga Akame Ninja training. At the ninja era, it was commun to send the futur ninja at a young age to Akame for their training. The attractions are free to use but some require a trainer and cannot be use else way. Period All year round, closed from the 28th of December to the 2nd of January and on Wednesday from the 3rd of January to the 13th of March. Who can participate Above 4 years old. Children under 7 MUST be accompanied by an adult. * If you don't need the Ninja outfit you have a 700 Yens price reduction. The ninja outfit rental cost 700 Yens and comes in different colors (black, blue, red, pink, etc). Beware that the adult outfit sizes and number are quite limited. 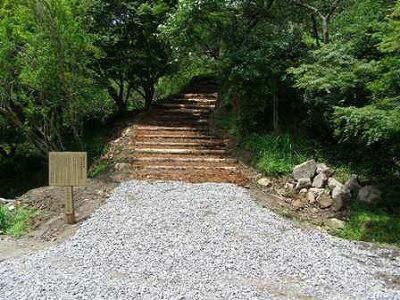 * The fees include the entrance to the Akame 48 waterfalls. Time required About 1 hour and a half depending on the number of participant. Minimum participant number At least 2 persons. Application Please apply at least 1 hour before the training start time. If you expect to come on a busy day (weekend for example or national vacation days) it might be wise to make a reservation. Useful information ・The participation depends on the weather and the number of participant already registered. ・If you rent the Ninja outfit please arrive 30 minutes prior to the start time. 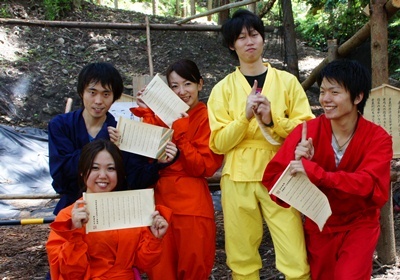 ・You can rent the Ninja outfit only for 700 Yens. ・There is a fitting room next to the entrance. ・If you don't know how to wear the Ninja outfit just ask to the reception. 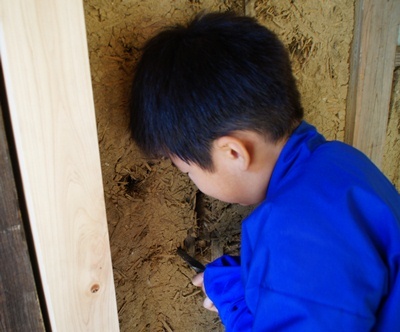 ・When it rains the training can be made inside but during typhoons or other natural disaster the training might be cancelled. 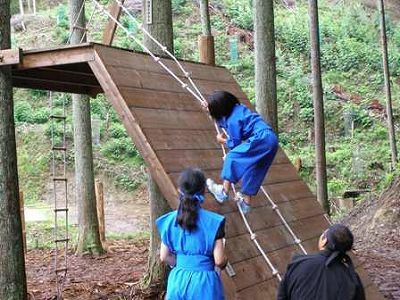 ・Some of the attractions are free to use by yourself, but it's at your own risk. Please keep in mind safety and watch over your children carefully. ・Please come wearing easy-to-move clothes. ・Please be careful with clothes and personal belongings like camera and bags which could be dangerous if caught in the training set or tools. ・Please come with shoes that you feel confortable wearing. Please make your reservation here: "". * Answers are english only. If you want to make an online reservation please send us an email with the number of participant and their age and the day you want to attend the training. You will then receive an confirmation message. * Your online reservation is not confirmed until you receive a confirmation message from the Akame 48 Waterfalls center. ※Reservation mail are read from AM8:30 to PM5:30. The training tools are free of use, but you have to respect the rules and listen to what the trainer tells you about them. Used in the wrong way the tools may harm you or other people, so please be careful. Children under 7 have to be accompanied by an adult. Beware! Beyond this point is the training place of the Iga Akame Ninja! 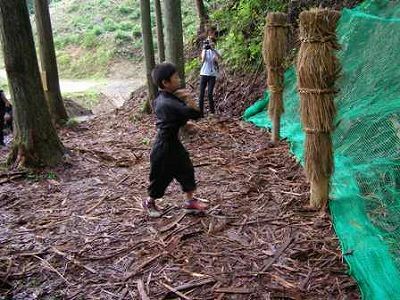 The training begin with the humming of the Kuji-kiri which help with mental concentration. This is the beginning of your Ninja training!! Learn to get over fortifications without any tool! The ninjas might have been the first free climbers! Train yourself on a 25 meters long 2.5 to 3.5 meters high wall. Learn how to get over a wall taller than you. Focus your strenght and learn to use climbing spears to get over anything! 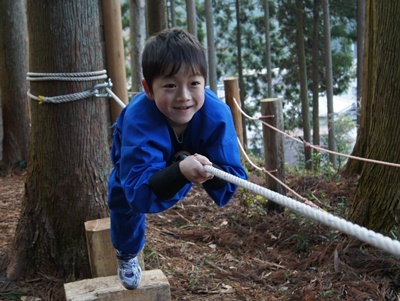 Use your legs to keep your equilibrium while you quickly cross a 15 meters rope! Learn to jump from trees to trees like the apes. Use a cord to fly even more far! A 15 meters long 5 centimers flat leash!Sharpen all your sense to get through it! 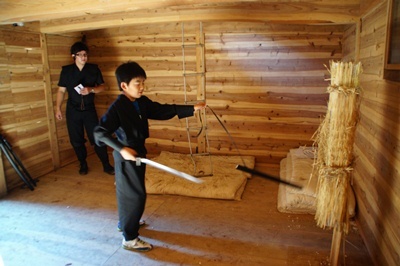 Learn how to climb a wall using special ropes and sickles! Learn how to get swiftly over walls... with the correct tools even the strongest castle walls are no worries for ninjas! This technique allow ninjas to walk on the edge of wall and rooftop undetected, with no noise, really quickly. It takes a lot of equilibrium! Learn the Raccoon dog technique, or how to climb tall trees to make yourself invisible to the enemies. 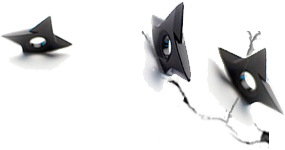 Learn not only how to throw shuriken but also how to target vital body part, and how to throw then while you fly away! Learn how to throw 4 spikes and 8 spikes Shuriken at the enemies! Learn how to vanish through hidden doors and escape through holes! Find your enemies in the dark! Use your sword sheath to find them and knock them down in a single stike! Learn hot to easily open a hole in a wall or the floor to spy and enter a house in stealth. Learn how to walk through water without getting wet! 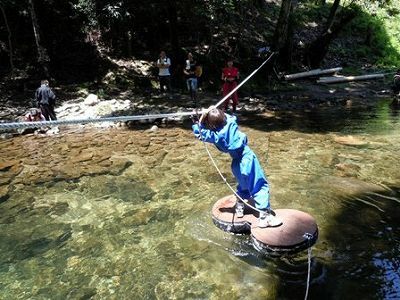 Standing on the board on flowing water might be more difficult than it seems! You receive the Iga Akame ninja certification parchment after you finished all the training! If you want to take part to the Ninja training please send us a email at least 2 days before. We will send you back a email to confirm. Your participation to the training cannot be garanty until you receive the confirmation mail. Please take into account that we check email between 9:00 and 17:00.